SVHS art students include, front row from left, Sandy Hernandez, Ashley Mosley, Cameron Hux, Aliyah Wright and Krista Pendergrass. On the back row are, from left, Assistant Principal Mcshell Edmonds, Jose Reyes, Jose Gonzalez, Tony Elberson, Jordan Salazar and Principal Stephanie Ayscue. Standing at back center is Assistant Principal Desmond Thompson. 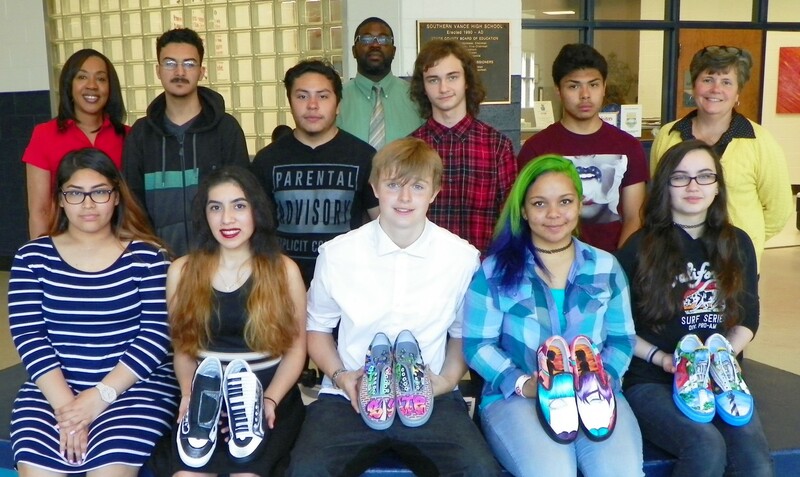 Southern Vance High School art students have entered the Vans Custom Culture Shoe Competition and have been chosen as one of only 50 school groups across the United States to compete in regional competition for top honors! 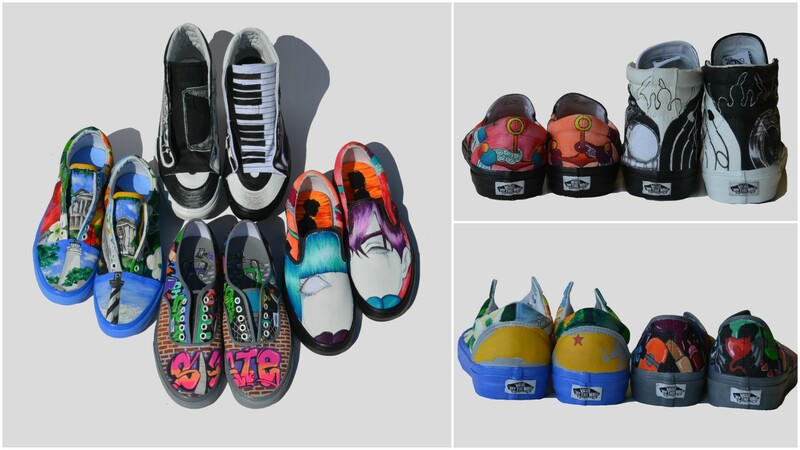 The students, all enrolled in Intermediate Visual Art classes with Amy Simpson, hand painted four pairs of canvas shoes, sold by Vans Shoes, to depict scenes/art in four categories: music, action sports, art related and local flavor. The competition now continues online. From April 27 until May 11, supporters of the SVHS art students can go online to vans.com/customculture and cast your votes. Each person can vote once per day per region. The SVHS team’s shoes are in the Southeast region. There is no age requirement for voting. Please share this information and encourage everyone to go online and cast votes over the next two weeks for the impressive work done by these talented students!